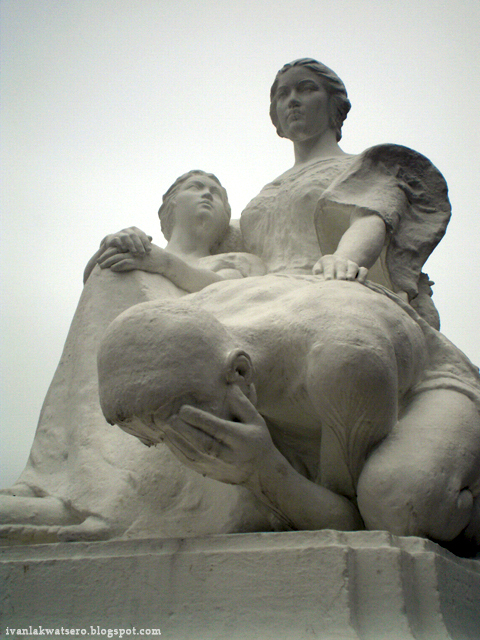 "La Madre Filipina", the sculpture located a few meters from the Rizal Monument in Rizal Park. "La Madre Filipina" is one of the four statues mounted on four pedestals that were originally located at the four corners of Jones Bridge. Literally "the Filipino Mother", it depicts the love and sacrifice a Filipino mother can do for his family. When the Japs bombed the then magnificent-looking Jones Bridge during the World War 2, the whole bridge collapsed except the four statues. 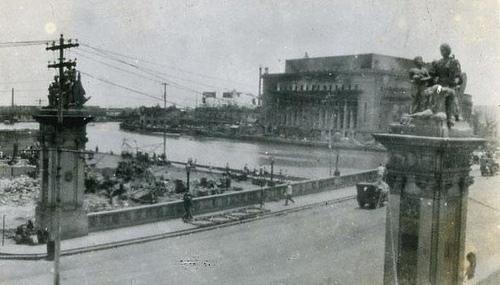 After the war, the four statues were dismantled and were moved to their current locations, one in Rizal Park, two in front of the Court of Appeals building and the other one is missing. seen in the picture are two of the four "La Madre Filipina" located at the corners of Jones Bridge. During the Spanish era, the zero kilometer reference point for all locations in the Philippines was placed on the cross atop the central dome of Manila Cathedral. 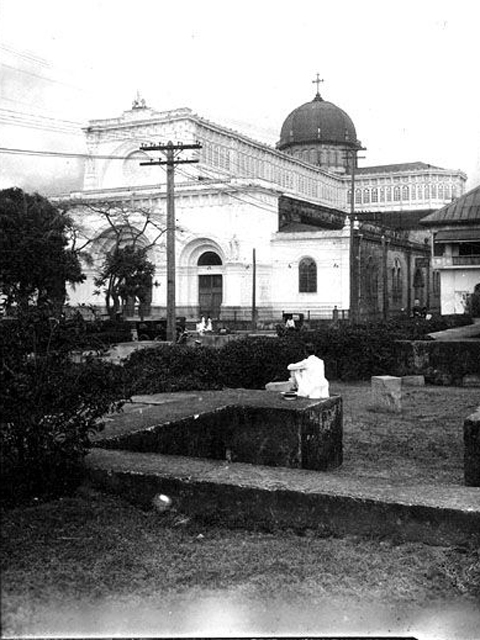 The Americans moved the reference point to its current location upon the completion of the beautification of Bagumbayan sometime in the early 20th century. 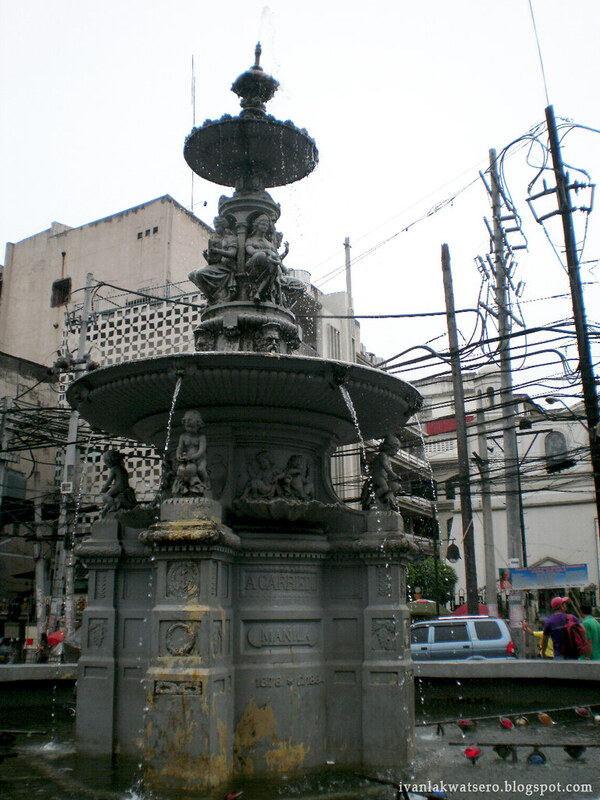 The old Carriedo Fountain was originally located at the intersection of Legarda, Nagtahan and Ramon Magsaysay street, but the construction of the Nagtahan flyovers during the late 70's caused the transfer of the fountain first to MWSS Building in Quezon City then finally to Plaza Sta. Cruz fronting the Church of Sta. Cruz. 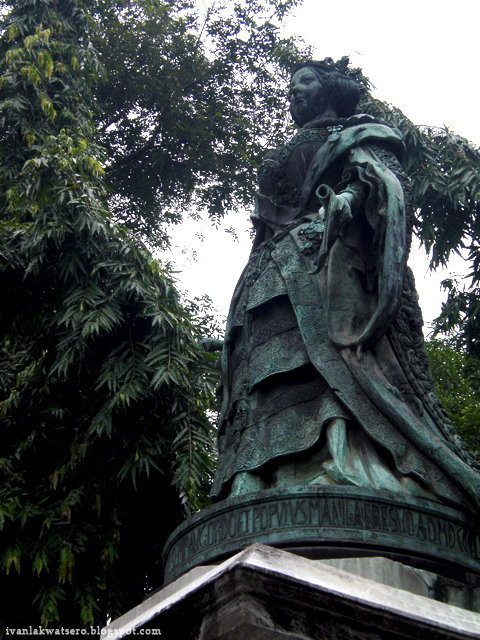 From the bodega of the old Ayuntamiento, this bronze statue of Queen Isabel II stood in Malate Square fronting the Malate Church in 1896. 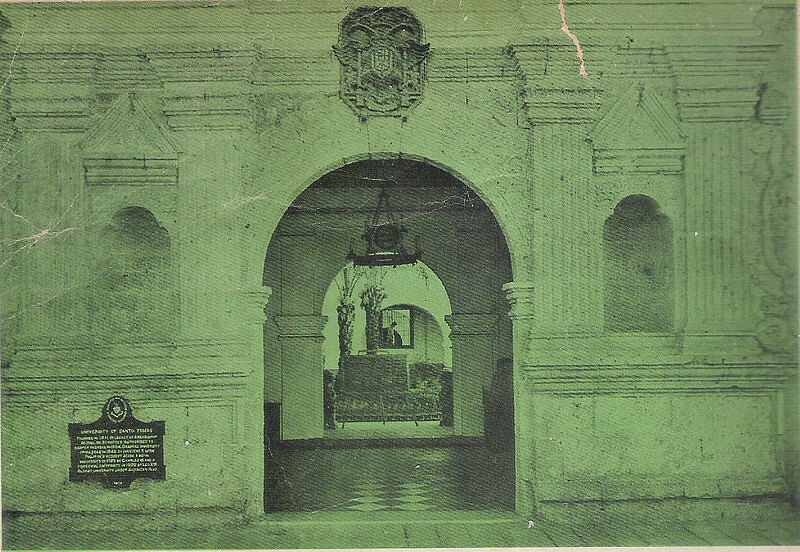 But after a typhoon blew it down, it was moved to its current location in front of the Isabel II Gate in Intramuros in 1975. The Malate Square now have a fountain and a dramatic statue of Rajah Sulayman. 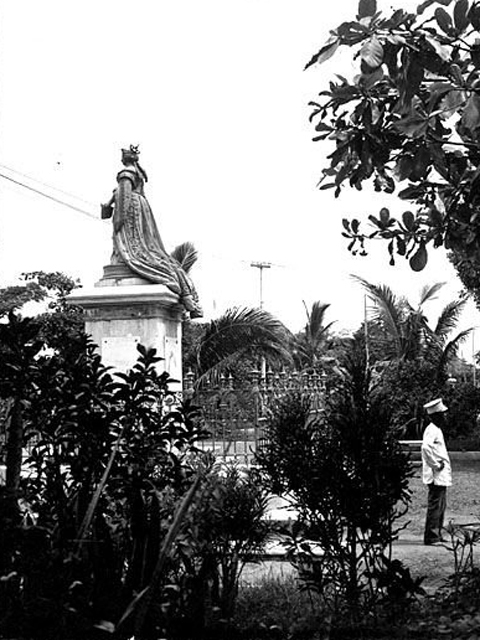 old photo of the statue in Malate Square. Unknown to many PLM students (batches after 1997) that this statue of Gen. Douglas MacArthur used to stand at the façade of PLM at the main gate. 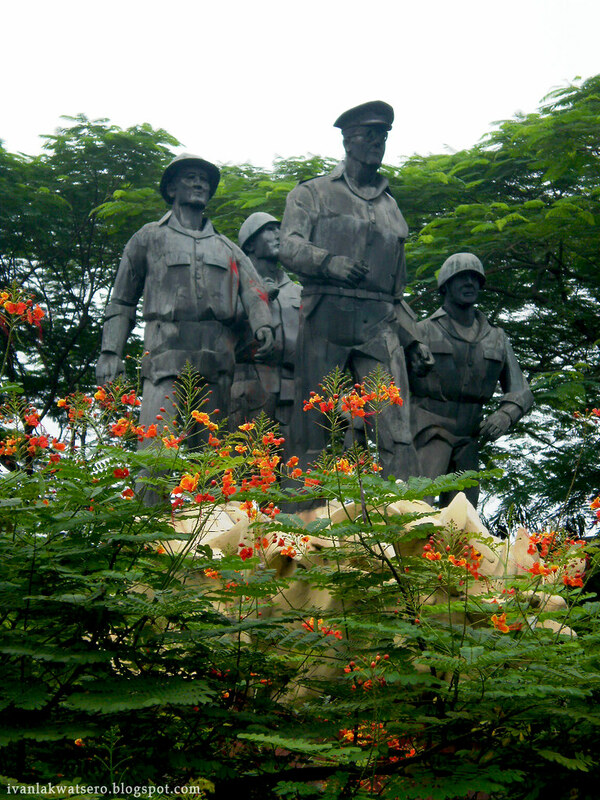 Having no relevance to the Pamantasan, the statue was brought to its current location in 1997 at the foot of MacArthur Bridge. 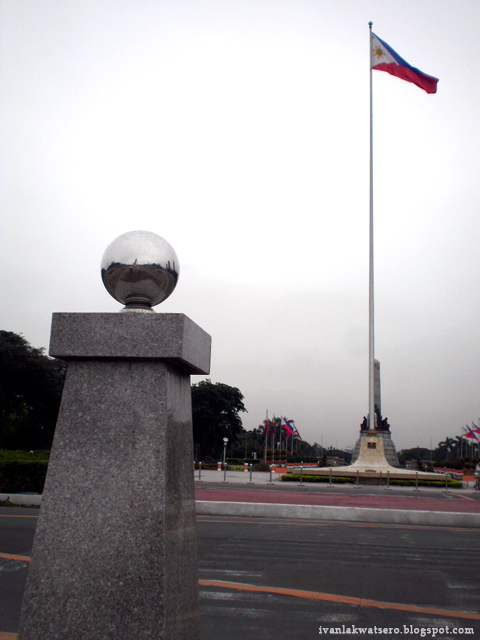 It was replaced by the PLM Flame but again replaced recently by a bust of Jose Rizal. So there you have it, 6 Misplaced Landmarks of Manila. Interesting facts, again, Ivan. *claps* Now, I've learned something new about The Metro. Haven't been to these places except Sta Cruz and UST so maybe I'd pay a visit to others sometime. pinapahanga mo talaga ako. san mo nakukuha yang mga info na yan! 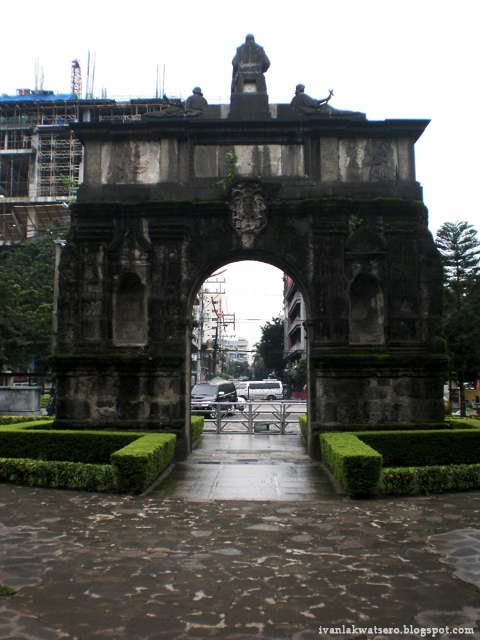 ang galing, naalala ko tuloy nung napadpad tayo sa Intramuros, instant tour guide ka namin, abangan mo ang post ko bout Manila, na dapat ay sa blog carnival ni kuya angel, late na kasi pero ipopost ko pa rin..hehe! sir first visit ko sa blog mo, ANG GANDA!! @elal, salamat. tara lets photowalk tayo. @Andrew, oo.. haha dapat tlga BA History kinuha ko.. pero ok lang.. masarap din naman aralin ang Biology. @Darwin, hobby ko kasi ang magbasa ng mga historic Markers ng NHI. lol, i-blog mo na yang intramuros. Parang mali yung misplaced kasi these landmarks were moved intentionally or by force of circumstances. anong tawag mo sa mga bagay-bagay na na-moved by force of circumstances?